Ghassan and Nadia Alasaad are a married couple residing in Massachusetts, where Mr. Alasaad is a limousine driver and Ms. Alasaad is a nursing student. They are U.S. citizens. In July 2017, they traveled to Quebec on a family vacation with their daughters and other relatives. When they reentered the United States, their 11-year-old daughter was sick with a high fever. At the border, they were directed to a secondary inspection, where Customs and Border Protection officers questioned Mr. Alasaad and searched through his unlocked phone, dismissing concerns about their daughter’s worsening fever and need for care. In response to Mr. Alasaad’s question as to why the family was being detained and searched, a CBP supervisor responded that he had simply felt like ordering a secondary inspection. After five hours of detention, a CBP officer ordered Ms. Alasaad to provide the password to her locked phone. The Alasaads objected, in particular because Ms. Alasaad wears a headscarf in public in accordance with her religious beliefs, and she has photos in her phone of herself without a headscarf. The CBP officer told the Alasaads that if they didn’t disclose the password to Ms. Alasaad’s phone, it would be confiscated. The Alasaads reluctantly wrote down the password. Ms. Alasaad told the officer that a male officer could not search her phone because it had photos of herself without her headscarf. The officer told them that it would take two hours for a female officer to arrive, and then more time to search the phone. Based on what they were told, the Alasaads understood that they would need to wait several hours for their phones to be searched. Exhausted and desperate to attend to their daughter’s health, the Alasaads departed without their phones, about six hours after being initially detained. The Alasaads received their phones approximately 15 days later. Soon after, Mr. Alasaad attempted to access videos of his daughter’s graduation. The phone displayed the message, “Sorry, this media file doesn’t exist on your internal storage.” This problem did not occur before CBP’s search and seizure of the phone. I am an entrepreneur who owns 2M Solutions Inc., a Texas-based company that helps install security systems for governments and private entities around the world. This includes providing services to the federal government as a certified contractor. My training as a computer engineer has allowed me to develop technical solutions for my company’s clients, including installing security cameras and access controls to protect their physical buildings. My growing business regularly requires me to travel internationally. In January 2017, I was returning from a trip abroad via Dallas/Fort Worth International Airport. I was carrying my regular phone, which was locked, and a phone I use while travelling internationally, which was unlocked. Agents detained me and seized my phones. They took my international phone away from me for about 30 minutes. I assume they searched it. When an agent returned with my international phone, he demanded access to my regular phone. I was concerned about agents accessing private information on my phone and I also knew that I had a legal right to say no. So I declined to unlock it. Agents then confiscated both my regular phone and my international phone while letting me go home. More than two months later, agents returned the international phone to me. I have yet to be able to get my regular phone back. I filed this lawsuit because asserting your rights at the border should not result in agents confiscating your phone for months on end. Moreover, agents should not be able to search anyone’s digital devices without a warrant. I am an engineer at NASA’s Jet Propulsion Laboratory in California, where I’ve worked for over ten years. I’m an American citizen—born and raised in the United States. Apart from work, I race solar-powered cars, often traveling abroad. I raced with a team in Chile in January 2017. On my way home, I entered the United States through Houston, where border agents detained me and seized my phone. They instructed me to give them my password to unlock the phone. I tried refusing, but the agent insisted I was required to cooperate. He gave me a form stating “collection of this information is mandatory at the time that CBP or ICE seeks to copy information from the electronic device.” It noted consequences for failure to assist them in copying the information from my phone. I finally surrendered my password because I had no plausible choice. A border agent took my phone away from me for about half an hour. The agent returned and told me they had used “algorithms” to search my phone—indicating they used forensic tools to capture and analyze the private information I keep in my phone. The government didn’t just scrutinize my private information. They also examined emails, texts, and other private information that friends, family, and colleagues had sent me. I don’t want this to happen again—to me or other American citizens returning home. We shouldn’t forfeit our rights or risk our privacy whenever we leave the country. Americans shouldn’t be afraid to come home. I am a visual journalist and documentary filmmaker who regularly covers international news in South America and the Caribbean. As a videographer with more than 10 years experience, I have produced dozens of documentaries. My work has appeared in U.S. and international media, including the New York Times, NBC, Vice News, Discovery Channel, Al Jazeera, CBC in Canada, TeleSur in Venezuela, and Channel 4 News in London. One story I helped produce, “Haiti in a Time of Cholera,” won an Emmy in 2014 for Outstanding Investigative Journalism in a News Magazine as well as a Peabody Award. Our reporting showed how a devastating cholera outbreak in Haiti originated with United Nations peacekeepers who arrived after the 2010 earthquake. My 2010 story, “Haiti Six Months On,” which documented the poor relief efforts underway in the wake of the earthquake earlier that year, won the Alfred Dupont Award from Columbia University. Regularly reporting from abroad has reinforced my belief that the United States’ protections for free speech and privacy are essential to promoting an open and accountable democratic society. In December 2016, border agents detained me twice when I returned home from reporting in Haiti to spend Christmas with my daughter. The first time, at Miami International Airport, multiple agents placed me in a small room and began interrogating me about my work. When they demanded that I tell them my phone’s passcode, I believed I could not refuse. With my phone unlocked, agents were able to access some of my most sensitive reporting work, including communications with editors about particular projects and photographs taken while on assignment. After extensively questioning me about my work for several hours, agents finally let me go. A day later, agents once more detained me for several hours as I traveled across the border with my daughter. They again demanded that I unlock my phone. Given that it was past midnight and my daughter was trying to sleep on my lap, I did not think I could say no. Agents once more interrogated me about my work and held my daughter and me for nearly seven hours. The ordeal scared my daughter and made it difficult for us to enjoy Christmas. I filed this lawsuit because I do not believe border agents should be able to violate my rights so easily. Aaron Gach is a California-based artist and professor. He is a U.S. citizen. In February 2017, he arrived at San Francisco International Airport on a flight from Belgium, where he had participated in an art exhibition. A Customs and Border Protection officer directed Mr. Gach to a secondary inspection area, where two officers asked him detailed questions and told him they needed to search his phone. They refused to explain why, and told him his phone would be held for an indeterminate amount of time if he did not disclose his password. Because he had no meaningful choice, Mr. Gach entered his password and handed over his unlocked phone. Read more about his story. Isma’il Kushkush is a Virginia-based freelance journalist. He is a U.S. citizen. Since January 2016, he has been subjected to three invasive, warrantless searches at different border crossings. In January 2016, Mr. Kushkush traveled to New York City from Sweden, where he had been conducting research for his masters thesis on refugees for Columbia Journalism School. He had a locked laptop computer and two unlocked phones with him. Upon his arrival at JFK International Airport in New York, he was taken to a secondary inspection area, where Customs and Border Protection officers questioned him and searched his belongings. The CBP officers took Mr. Kushkush’s laptop and two phones out of his sight for approximately 20 minutes. After about three hours, he was allowed to leave. One year later, in January 2017, Mr. Kushkush traveled to Washington, D.C. from Israel, where he had completed an internship with the Associated Press through an award from the Overseas Press Club Foundation. He carried a number of devices he uses mainly for his work. Upon landing at Dulles International Airport, CBP officers took Mr. Kushkush to a secondary inspection area, where they questioned him and searched his notebooks. They also asked Mr. Kushkush for his social media identifiers and his email address. 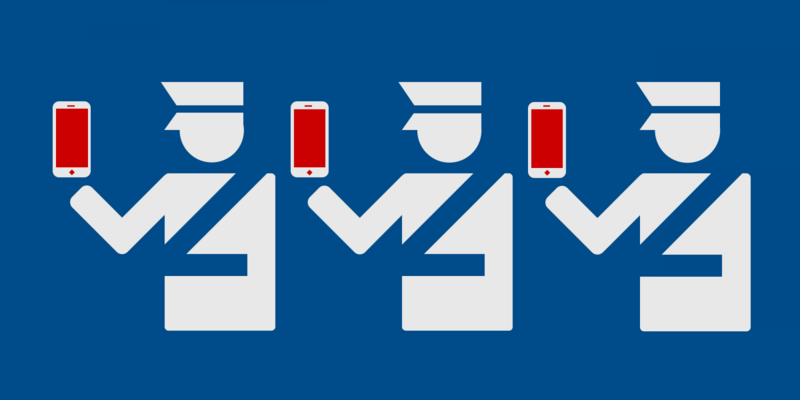 A CBP officer demanded to see Mr. Kushkush’s phone and told him to unlock it. Because he had no meaningful choice, he complied. The officer searched through the phone’s contents in front of him. CBP officers also took Mr. Kushkush’s laptop, voice recorder, camera, flash drives, and notebooks into another room. They allowed him to leave after having spent about 90 minutes in the secondary inspection area. In July 2017, Mr. Kushkush attended a language program at Middlebury College in Vermont. During the program, he traveled with a group of fellow students to Montreal. When he reentered the U.S. at Highgate Springs, Vermont, he was taken to a secondary inspection area. After waiting for an hour, a CBP officer instructed him to unlock his phone, threatening to seize it if Mr. Kushkush didn’t comply. Mr. Kushkush unlocked the phone, stating that he was doing so against his will. The officer wrote down the password and took the phone out of Mr. Kushkush’s sight for about an hour. After three hours, he was directed to a separate area, where he was questioned about his work as a journalist. After having spent a total of three and a half hours in the inspection area, he was released. I am a former Air Force captain who has spent a decade serving the U.S. armed forces. Upon graduation from the Air Force Academy, I served as an officer on active duty for six years. Then I spent another five years working in the defense industry supporting our troops—including 18 months in Baghdad, Iraq. I was stationed in Washington, D.C., on 9/11. That experience shaped my career, and strengthened my commitment to protecting our nation. Now I’m an assistant professor of homeland security and global conflict studies. Many of my students will dedicate their lives to our nation’s security. This past June, I flew into Miami from abroad. Border agents confined me to a small room. They told me to unlock my smart phone and laptop computer. I obeyed because I felt I had no choice. I watched them search my laptop. They took my phone for about two hours, and presumably searched it, too. As I sat in the interrogation room, I felt humiliated and violated. I worried that border agents would read my email messages and texts, and look through my photos. I feared they would download all of my personal information and contact lists, and share it with other government agencies. This was my life—and a border agent held it in the palm of his hand. I filed this lawsuit because I strongly believe the government should not have the unfettered power to invade your privacy. I want to stop this from happening to anyone else. Border agents should get a warrant before searching our phones and computers. Zainab Merchant is a Florida-based graduate student in international security and journalism at Harvard University. She is also the founder and editor of “Zainab Rights,” a media organization covering current affairs, politics, and culture. She is a U.S. citizen. In March 2017, Ms. Merchant visited her uncle in Toronto. On her way home, she was stopped at a U.S. customs preclearance station at the Toronto airport. Customs and Border Protection took her laptop out of sight, and told her to unlock her phone. When she objected, she was told the phone would be seized indefinitely if she did not comply. In tears, she unlocked both devices, which were taken out of her sight for roughly an hour and a half. CBP agents then questioned Ms. Merchant about her trip, her religious affiliation, and her blog. They specifically asked about an article she had written on her blog that described a previous border crossing experience. When Ms. Merchant’s devices were returned to her, the Facebook application on her phone was displaying her friends list. That was not the case when she had given up the phone. I am an independent filmmaker and native New Yorker who runs my own company, True Intent Productions, LLC. My documentary “Waiting at the Door,” a film about Syrian refugees, won the Grand Jury Prize at the State University of New York Wide Film Festival in 2016. I received a bachelor’s degree in digital media studies from SUNY Buffalo in 2015 and I am currently pursuing a master’s degree in screenwriting at DePaul University. As part of my work, I regularly travel internationally multiple times a year, including to Europe and the Middle East. While returning from filming in Canada in January 2017, border agents detained me for nearly two hours and demanded all sorts of information from me, including my phone’s passcode. I feared that refusing their demands would result in them holding me at the border indefinitely. Agents took my unlocked phone away for more than an hour and refused to tell me what they did with it. I was eventually allowed to leave and return home. A few days later, while returning from a day trip to Canada, I was once again detained and told to hand over my phone. When I refused, three agents used force against me. One agent grabbed my neck and began to choke me while another wrapped up my arms and legs. The third agent reached into my pants’ pocket and took my phone, all while I was in severe pain and fearing for my life. Agents once more took my phone out of my sight, only to later return it without any explanation for what they did with my phone. I filed this lawsuit because border agents should not be able to physically or otherwise coerce people into providing access to their phones, which contain vast amounts of private and expressive information. I’m an independent computer software programmer living in Colorado who loves outdoor adventure, travel, and ultimate Frisbee. In the spring of 2016, I spent five weeks traveling in Southeast Asia where I visited friends and participated in four ultimate tournaments. When I flew home to Denver, border agents detained me, and told me to unlock my laptop computer. I refused because I do not believe the government should have the right to examine and copy private emails, contacts, photos, and work information without a warrant from a judge based on probable cause. I had read of cases where border agents asserted the power to search the computers of journalists and I believe it is not right. In response, border agents confiscated my laptop, smart phone, and camera. They told me it could be as a long as a year before the government would return my devices. Later that day, I spent nearly $2,500 to buy a new laptop and phone—tools I require to earn a living. The government kept my devices for almost two months. Later, with the help of the EFF, I used the Freedom of Information Act to learn about what the government did with my devices. They extracted data from my camera and my phone’s SIM card. They also attempted to use a forensic tool called MacQuisition to copy everything on my laptop. I strongly believe that people should be able to travel to other countries without having their privacy invaded and exposing everything on their laptops and phones to government scrutiny. That is why I’m suing the government.